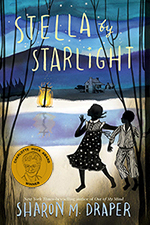 November 21, 2015, Minneapolis, MN: Stella by Starlight by Sharon M. Draper (Atheneum Books for Young Readers) has been named the winner of the 2016 Charlotte Huck Award for Outstanding Fiction for Children, and Drowned City: Hurricane Katrina & New Orleans by Don Brown (Houghton Mifflin Harcourt Books for Young Readers) has been named the winner of the 2016 Orbis Pictus Award for Outstanding Nonfiction for Children. The NCTE Orbis Pictus Award is named for Orbis Pictus—The World in Pictures (1657), considered to be the first book actually planned for children. Tiger Boy by Mitali Perkins, illustrated by Jamie Hogan (Charlesbridge). Two White Rabbits by Jairo Buitrago, illustrated by Rafael Yockteng, translated by Elisa Amado (Groundwood Books). Terrible Typhoid Mary: A True Story of the Deadliest Cook in America by Susan Campbell Bartoletti (Houghton Mifflin Harcourt). W Is for Webster: Noah Webster and His American Dictionary by Tracey Fern, illustrated by Boris Kulikov (Farrar, Straus and Giroux). The National Council of Teachers of English, with 30,000 individual and institutional members worldwide, is dedicated to improving the teaching and learning of English and the language arts at all levels of education. 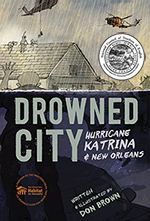 This document was printed from http://www.ncte.org/press/2016-childrens-book-award.